Over her historic career, Björk has incorporated countless new genres and ideas and bent them to her will, releasing some of the most boundary-pushing music of the past 25 years. If Tuesday's (October 25) Red Bull Music Academy DJ set proved anything, it's that the 50-year-old's affinity for eclectic records has not been diminished in the slightest. Her three-hour set was an odyssey of music that ranged from the avant-garde to the accessible, the obscure to the mainstream. Cloaked in a Venetian mask, the music legend took to the decks on a subdued note, beginning with a mix of avant-jazz, classical and traditional folk selections from David Lang and Tenores di Bitti. Björk's approach was subtle, manipulating and dragging out sections until their breaking point. When it worked, it made for some lovely soundscapes; when it didn't it bordered on tedium, especially for a dance-ready crowd who waited over 40 minutes into the set for the first hint of percussion. Their patience was rewarded. From the thunderous one-two punch of Peder Mannerfelt's "Limits to Growth" and Björk collaborator Arca's "Snakes" onward, the second act of her set was defined by abrasive and punishing beats. The club's ample soundsystem was pushed to the limit, making every rush of bass a kick to the solar plexus. Though this section featured crowd-pleasers from the aforementioned Arca and Lotic, she was also sure to include underground cuts from Endgame, Zdob si Zdub and Mala, even throwing in hints of Indian and Senegalese music to keep listeners on their toes. However, the most surprising thing about Björk's set wasn't her affinity for hidden gems and forward-thinking beats — that's what you expect from trailblazers like her. The real shock was that in addition to all this, Bjork is actually a great party DJ. 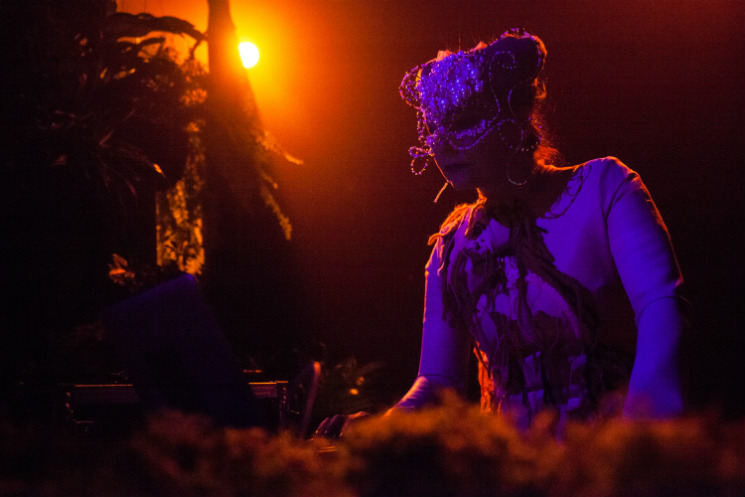 Where some artists use DJ sets as an excuse to phone it in and make a quick buck, Björk was a spellbinding performer even behind the decks. Her impromptu (yet impressive) dance moves brought cheers and unworthy imitations from the crowd. The back half of Björk's set featured more experimental beats but also a hefty dose of pop and R&B, featuring standout offerings from Nao and Ariana Grande and a lovely Hindi version of "I Will Survive" courtesy of Usha Uthup. By the time she capped off the journey with a sublime pair of Jeremih cuts and a piece of traditional Indian music, Björk's had given the crowd plenty to think about and even more to dance to. We should have known. After all, she's been striking a balance between the two for 25 years.